Only spoke on the phone and we had a very pleasant exchange. Went to the office once , but it was closed. No worries...Just looking for local things to do..We found everything fine. Had a great visit to the Big island with my wife and son and girlfriend. Very clean and master bedroom was enormous!! Bottom floor was perfect for us on the lanai every morning and night.Outdoor grill was used and saved us money not paying for dinner every night.. Mahalo.. It was much better than a hotel both in price and in space. We were able to cook our own meals and do laundry. Both things we could not have done in a hotel. And we had all the amenities of a hotel at our convenience: beach, pool, hot tub, restaurants, shopping, etc... It was clean, professionally decorated, spacious and had all the kitchen utensils you would need. There was a book with things to do in the area. I would stay at this property again and I would recommend it to friends! What a wonderful home away from home for 10 days ... waking up with coffee and watching the sun come up on the lanai ...grilling then enjoying the evening .. such a comfortable area! The Villa is very spacious, immaculate! It had everything you need from kitchen amenities to a wagon, chairs and snorkeling equipment to take to the beach. There was nothing we needed! A lot of rest and relaxation ! The Hilton pass was awesome also ... beautiful beach you can walk to ... Lava Lava Beach Club .... FUN! If we get a chance to come back we surely will stay there! Highly recommended ! Absolutely stunning!!! So very relaxing and enjoyable. Loved the location but also the "home" feeling! So much seemed so close so it was always a quick drive or walk. The condo was very quiet and spacious. The amenities were fabulous! The lanai was our favorite place to have a coffee and a snack as we relaxed and took in the view of the mountains. We can't wait to stay there again! Kim from Maintenance was fantastic. She addressed any concerns I had within minutes. Thee maintenance man was very professional and knowledgeable. We will definitely be back. We typically come to Hawaii every two years. I know which condo I would like to rent the next time we vacation in Waikolola. All needed information was conveyed in a timely fashion, including suggestions that early and late checkin/out might be possible, and when a request was made it was generously granted. Very helpful. The property was well equipped, clean and pleasant. Checking in and out was easy. The recreational equipment that was available to us was an added bonus, including the snorkel equipment and bicycles. We were very pleased with everything. We had minimal contact with the members of the property team due to the booking process being so stress free,and the check-in/check-out instructions being easy to follow. All of the property staff that we came across were very friendly and welcoming. We had a fantastic vacation on the Big Island at Waikoloa Beach Villas! We found the condo itself to be extremely clean and the perfect fit for our family of five adults. One of our favourite features of the property was the loft, allowing us to utilise two living areas. We loved being able to do laundry within the condo, and also enjoyed using the facilities of the full kitchen. The beautiful pool and hot tub area could be seen from the lanai, and was a short stroll from the condo. 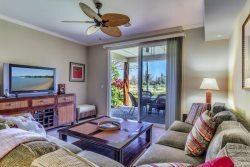 We believe Waikoloa Beach Villas to be the best situated within the Waikoloa Beach Resort area, withh Queen's Marketplace and King's Shops just across the street, and A'Bay Beach only a short five to ten minute walk away.